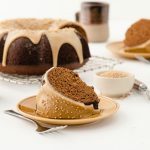 This luscious pound cake gathers the traditional gingerbread spices, molasses, brown sugar, and enhances them with bright mustard flavour, both powdered and Dijon. Whole mustard seeds add texture and a delightful burst of sweet heat to the rich caramel glaze. Bake this handsome, aromatic batter as a pound cake, Bundt cake, or in loaf pans and expect compliments aplenty! Generously grease a 10 cup Bundt pan or tube pan using canola oil. In a large pot 5 qt pot, combine the molasses, coffee, butter, granulated sugar, and brown sugar. Place over medium-high heat and stir constantly until the butter melts and the sugars dissolve. As soon as this dark, syrupy mixture comes to a boil, remove from heat. Add the baking soda to the pot of syrup and immediately begin to stir constantly, while the dark syrup foams up almost to the top of the pot and bubbles wildly. Keep stirring until the foaming calms down and the liquid returns to its original syrupy state. Transfer to a large bowl and cool to lukewarm, whisking or stirring now and then to help the syrup cool. Combine all the dry ingredients (all-purpose flour to salt) in a large bowl. Use a whisk or a fork to stir them well and combine them evenly. When molasses-mustard syrup is lukewarm, add the buttermilk, Dijon mustard, and finely-grated fresh ginger to the bowl and stir to mix them in well. Add the eggs, one by one, stirring well with a whisk or a fork each time. Pour the molasses-mustard syrup over the dry ingredients in the large bowl and whisk to mix everything together into a thin, dark, evenly combined batter. As soon as batter is smooth, pour it into the well-greased Bundt pan and place it in the preheated oven. Bake for 50 to 60 minutes, until a toothpick or skewer inserted into the center comes out clean and the top has risen and the sides are firm, dry, and beginning to pull away from the pan. Cool in the pan on a wire rack or a folded kitchen towel for 15 minutes. Then loosen edges gently and turn the cake out onto a wire rack and let cool completely. 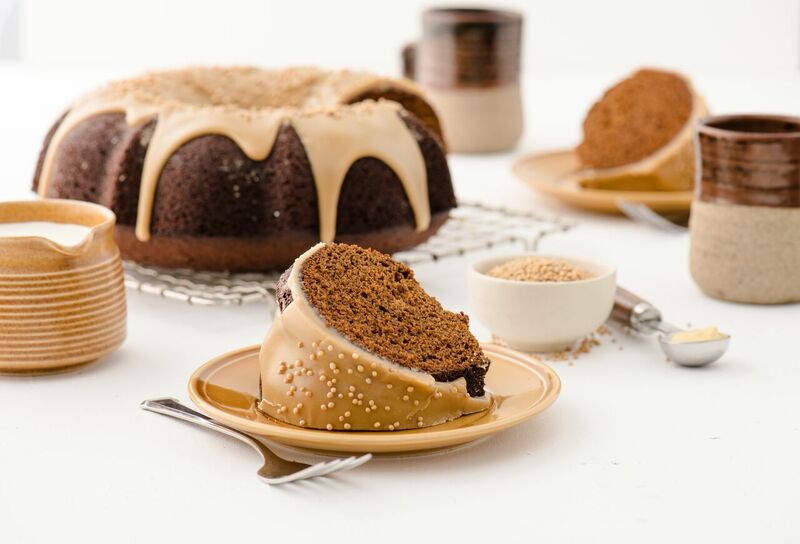 Make Caramel-Mustard Glaze with Mustard Seeds while the cake cools. Transfer cooled cake to serving plate or cake stand, and have mustard seeds handy. Pour the warm, freshly–made glaze over the cake carefully and evenly, allowing glaze to flow down the sides handsomely. Immediately sprinkle the yellow mustard seeds all over the freshly-glazed top of the cake, patting gently to help them stick to the glaze. *Use a microplane grater to grate the ginger, so that it is very soft, juicy, and fine. Or chop it well and combine with buttermilk; puree both in blender to break down ginger’s fibres. You could use light brown sugar in place of dark brown sugar.